One of the best books I have ever read. I think I need to reread it regularly. It has so many powerful insights that I really don't even know what to right. There are so many analogies and examples that help explain how the Atonement works in our lives. It is not a one-time event, nor something that only happens when we are working our hardest. Christ is there to help us work our hardest. His Grace does everything for us. Here are a few favorite quotes:"Christ's requirements (commandments) are not so that we can make the best of the Atonement, but so that --on His generous terms--the Atonement can make the best of us"We are saved by Grace after all we can do = "We are saved by grace 'apart from all we can do', or 'all we can do notwithstanding.' or even 'regardless of all we can do.' ... 'We are saved by grace, after all is said and done'""No matter where I am on the mountain, the motivation to climb higher is found not in trying to impress God and Christ with my sacrifices, but in letting their sacrifices be more deeply impressed upon me. ""[God] is bound to love me--not because I am good, but because He is good. "There are so many jewels in this book that I could just end up quoting the whole book, so I will stop. I highly recommend this book. It is a very hope-filled and encouraging book. It is never too late for us, and Christ is not waiting at then end of a long to-do list to greet us, he is right beside us reaching his hands towards us to help us through everything in our lives. Some books can change your life. This one changed mine. It's the type of book I want to read again and again because I feel like I only scratched the surface. I don't often read doctrinal books unless they come from the leadership of the Church. Yet this book came to me highly recommended from a few key friends who said that it dealt with truths regarding the atonement. I was intrigued by these recommendations even though I only knew Brad Wilcox as an EFY speaker. I was duly impressed by the doctrine regarding continual repentance and how we come to obey the commandment "be ye therefore perfect." This book is written towards people who are often weary in well doing and overwhelmed by the many demands placed on them. This is a hopeful book about power of the atonement not just to get us on the right path, but also to stay on that path even though we make the same mistakes over and over and over again. Do you have a bad habit or a continuing challenge that you just can't seem to get over? Or do you have many of them? Have you vowed a vow many times never to do something again yet find yourself making the same mistakes again and again? This book addresses those circumstances and gives understanding and hope that you really aren't such a lost cause after all. I loved it! Tons of credit to the author. To substantively take on a confusing, central/primary, old religious topic by articulating new perspectives with humor, personal experiences and understandable explanations is quite an undertaking. One he succeeds at very well. He doesn't shy away from anything really - including the pretty flawed bicycle analogy and "after all we can do" troublesome verse. Key insight from this book: perfect freedom requires perfect love. I absolutely loved this book. It brought me so much peace and hope. Highly recommended. I heard the author talk about much of the material in this book and I preferred his speaking to his writing. That said, I still found this to be an inspiring and useful book.some favorite quotes:"Changes in belief always precede changes in behavior. ""It is one thing to follow Christ and another thing entirely to be led by Him. ""True faith in Christ is more than just knowing about Him or even believing He is divine. It is knowing that His Atonement is real, that its purpose is to transform us, and that it will be available as long as that perfecting process takes. ""Our needs—including the need for forgiveness—are continuous, and so is Christ's Atonement in its ability to meet those needs. ""[Christ] doesn't always clear the path, but He does illuminate it. ""One who chooses Christ chooses to be changed... [The Atonement] rehabilitates, regenerates, renews, and transforms human nature. ""We should recognize that God is pleased with every effort we make—no matter how faltering—to better ourselves. ""Save for the exception of the very few who defect to perdition, there is no habit, no addiction, no rebellion, no transgression, no apostasy, no crime exempted from the promise of complete forgiveness. That is the promise of the Atonement of Christ. (Boyd K. Packer)"Wilcox's down-to-earth writing and clear examples make a difficult subject much easier to understand. This book's title says it all. It is an examination of the Atonement, but not just how the Atonement can save us at the end of our lives, but how it is our very real source for strength, solace, forgiveness and power each and every day, as we struggle along, mired in sins we repeat all too often. I know many others who, like me, have become discouraged at our apparent and obvious lack of perfection, even after years of trying to live the Gospel. The truths in this book are like a balm. I'm afraid if I try to write all my favorite quotes here, I'll be engaging in copyright infringement.So I'll just include one--one that may be going on a wall in my home: "When we speak of the human part of a covenant as something we can do without God's assistance, or the divine part of a covenant as something we can repay, we not only grossly overestimate our own abillities but we also see teh arrangement as a one-time deal. When we fully realize the continuous nature of the Atonement, gratitude and obedience are less a condition of receiving it and more a natural outgrowth of it. They become as continuous as the gift itself. In that moment, we realize we do not earn the Atonement. The Atonement actually earns us. "Beautiful book. Loved it. I rarely read "church" lit, but made an exception for this one, and it is excellent. This book is based on a talk given by Brad Wilcox, which can be found (free) in PDF format, here:http://speeches.byu.edu/?act=viewitem... If you think it's an excellent explanation for a complicated doctrine, and find it as comforting as I did, you may want to do what I did -- buy this book.In the acknowledgments, Wilcox quotes Dallin H. Oaks: "A call for repentance that is clear enough and loud enough to encourage reformation by the lenient can produce paralyzing discouragement in the conscientious. The dose of doctrine that is strong enough to penetrate the hard shell of the easygoing group may prove to be a massive overdose for the conscientious." Wilcox continues: "I choose to assume those reading these words are the soft-shelled survivors of many a massive doctrinal overdose focusing on the "Thou shalts" and the "Thou shalt nots." Lets leave the afflicting for another day. This purpose of this book is to comfort. "Anyone who thinks that "I do my best, and God does the rest," explains the Atonement, then this book is for you. I was a little sad when I finished this book. It was so uplifting and edifying that I would read a little bit of it every morning and then think about what I'd read during the day. This book is perfect for someone who is trying to understand why everyone is worthy of the Atonement, why justice and mercy are important, why Christ saves and redeems us. Wilcox shows why the Atonement should fill us with hope, not make us feel hopeless. I learn best through examples, and this book is full of them. Having turned the last page of this book, I feel like I have a deeper appreciation for Christ's Atonement and a more solid understanding about the beauty and hope found in His sacrifice. In my opinion, everyone should read this book. All of us can benefit from a little hope. Ironically, I picked this book up at the bookstore on a whim (rarely spend $20 for a book) & the next week my bishop recommended it. For those struggling to understand the concept of the atonement, or for those who understand it and are attempting to apply it to themselves, this book is amazing. I'm also always on the lookout for books written from an LDS perspective that deal empathetically with depression and mental illness, this book has a chapter specifically written on that topic. This book was quickly added to my list of books to pass on to future bishops when attempting to explain mental illness to those who are not familar with the accompanying challenges. Author, Brad Wilcox encourages greater understanding of Christ’s Atonement as he illustrates that this gift is meant to cleanse,change, and sanctify us. He talks a great deal about justice and how the atonement satisfies the demands of justice, so we can repent of our sins and become like God. We are ideally supposed to consecrate our lives to God and find joy in living as he asks, with no ulterior motives. For a condensed version of the book, read his speech entitled “His Grace Is Sufficient”. Absolutely wonderful book. Provided me with so much insight and understanding as to the purpose of the atonement and what it means for me in my life. It also made me feel at peace with my day to day struggles and helped me grow closer to my Father in Heaven. This life is a process; God knew we'd slip up sometimes and loved us enough to send his Son to atone for our sins. I would highly recommend it. Full review to come soon but for now all I can say is WOW! What a fabulously inspirational book! Ok here it is: I would like to give you a brief snapshot (a teaser) into each chapter.Chapter 1 However Long it Takes: The message of this chapter is: DONT GIVE UP. Even if you struggle with a serious addiction and you keep regressing. KEEP TRYING. "Even when we may not have completely forsaken a sin, each time we repent we are one step closer to that goal - we are closer than we think.... When we're tempted to give up, we must remember God is long-suffering, change is a process, and repentance is a pattern in our lives." (Page 15)Chapter 2 Who Needs a Savior?In this Chapter, Brother Wlicox shares a couple of stories from when he was a mission president in Chile. The first one he shares is about a man who didn't think he needed the Savior until his teenage son died tragically. He shares this quote by President Ezra T. Benson, "Just as a man does not really desire food until he is hungry, so he does not desire the salvation of Christ until he knows why he needs Christ." Chapter 3 He's Got us Covered"The English word Atonement comes from the ancient Hebrew word kaphar, which means to cover." After Adam and Eve partook of the forbidden fruit the Lord provided coats of skins for them so they were covered physically. Through the atonement we are also covered emotionally and spiritually. President Boyd K. Packer: "For some reason, we think the Atonement of Christ applies only at the end of mortal life to redemption from the Fall, from spiritual death. It is much more than that. It is an ever-present power to call upon to everyday life.... The Atonement has practical, personal, (and) everyday value." Chapter 4 What Does it Mean to be Redeemed?This chapter is about how the atonement can transform us if we let it. "Being recovered, rescued, reconciled, reunited, and reinstated, would all ultimately be disappointing if we could not also be renewed..... The goal is not just being with God, but being like God.... One who chooses Christ chooses to be changed." Chapter 5 One Lone BranchHe tells the most amazing story about an experience his brother-in-law had while on a scouting camp out. This story has stuck with me more than anything else in the entire book. It touched me so deeply I shared it with several of my friends and family.He also quotes Sheri Dew: "The Savior isn't our last chance; He is our only chance. "Chapter 6 After All We Can DoThis chapter focuses on the scripture found in 2 Nephi 25:23 "For we know that it is by grace that we are saved, after all we can do". He really analyzes the phrase "after all we can do" word by word. "In those anxious moments, the greatest comfort I have found is in knowing ANY effort is pleasing to God even if He and I both know it's not my all or my best.... He is more concerned with the offerer than the offering. "Chapter 7 Who made God the Enemy?In this chapter, he explains justice and mercy and how they are both essential to our salvation. "We read of the "wrath" and "anger" of God... without remembering that mercy is not made possible by removing justice but by sustaining it." "For those with eyes to see, God's love is found not only in the ark but also in the flood. It is found not only in His raising the city of Enoch but also in His destroying Sodom and Gomorrah...." Chapter 8 Exchanging Willpower for His PowerInspired by his mission president, Brother Wilcox explains the steps of repentance by exploring the UN-principles of the gospel: Un-faith, un-humility, un-recognition, etc. "God does not need our confession; we need to confess. Sin is wrong, but covering it up makes it worse because the only sins the Atonement can't reach are the unconfessed ones.... Confession makes problems a part of our past, while lying makes them a part of our future." Chapter 9 Faith Without Works (And Works Without Supervision)In this chapter, he dispels the belief that we are here to work out or EARN our salvation. "We serve others as He serves us - not in an effort to deserve grace, but to accept it and offer it as freely as it is offered to us.... not to EARN grace but to RETURN grace for grace." Chapter 10 A Lesson in MarbleIn this chapter, he talks about finding joy in life's ups and downs. He shares a quote from President Gordon B. Hinckley: "I know it isn't easy. It's discouraging at times, sure. Aren't you glad it isn't just fun all the time? Those valleys of discouragement make more beautiful the peaks of achievement." He concludes by giving a beautiful analogy. He compares the repentant sinner's life with a polished marble stone. "Look at the marble. Isn't it beautiful? What makes it beautiful is not that it is free from imperfections. If it were clear and white, with no flaws, it would look plastic and artificial. The marble is beautiful and useful BECAUSE of the dark veins, not IN SPITE of them. When we repent, our sins are gone, but the memories linger, just like these dark lines. However, as we keep our covenants and experience the sanctifying influence of the Spirit, it is as if those dark lines are polished over time. They actually become part of our beauty." I realize this is an extremely long review, but hopefully someone finds it helpful. Obviously, I got a lot out of this book and will refer to it again and again. It sits next to my bed so that I can reach for it whenever I'm feeling the need for something uplifting and encouraging. Loved this book. Brad Wilcox has an amazing way of explain how we can continually use the atonement in our lives. One of our missionaries came to get his “post” (mail, in the USA) and had a package from his grandmother. Turns out it was this book which he had received from someone else at an earlier date. He loaned it to us, otherwise, I wouldn’t have known of it and probably would not have sought it out. Everything has a purpose – I’m not sure what it is in this case, but I know that this book has caused me some deep thought. I will probably read it again when I get home and do some more thorough study of Wilcox’ references.The first chapter has a grabber of an example – a newly ordained priest is self-consciously blessing the sacrament. He has to start the prayer several times before he gets it correct and the bishop approves the ordinance. Brother Wilcox points out that even though it took several tries, the ordinance was still counted as perfect by our Heavenly Father. He uses this theme in many places in the book, pointing out how others, and himself in some examples, have stumbled repeatedly and been able to be counted worthy in the end. He goes into other aspects of the Atonement to which I had not given much, if any, thought. It is much like General Conference, to me, in that it has provoked much thought on the subject and I need to examine where my knowledge and testimony in relation the all-important subject of the Atonement. I did like this book. Would I recommend it? Yes, but not before I recommend Stephen Robinson's books: Believing Christ and Following Christ.Why the 3 stars? I agree with other readers that at times it was slow and often repetitive. There were a few topics I was disappointed that he skirted the issue or didn't pay it the attention that I would have desired, but that is the author's choice.The book did put the Atonement of Christ in a good perspective. Examples were generally experience based and well explained. It helped me to learn more about the Atonement and how I can more effectively apply it to my own life. And just as the author states at the beginning of the book, it is to help those that are striving to be good, just help them utilize the Atonement better.But, overall I think the book is worth reading. It will help you refine your understanding of the Atonement. This book without a doubt is one of the best books I have ever read on Jesus Christ and his Atonement. It has given me so much understanding, and more importantly to me, comfort. I feel the Savior's love for me more than I ever have in my life. Every page of this book was comforting and enlightening. I didn't hurry through this book. I savored every thought and every page. I loved Brother Wilcox's examples and stories. They are real and ones I could identify with. I am so thankful to understand this great principle of Christ's Atonement for all mankind. I am thankful to Brother Wilcox for his understanding and for sharing it with us. I love my Savior more than ever and appreciate His attributes and love for me and for every one who has ever lived. It is truly a beautiful thing. This book completely changed my view of the atonement. I thought I understood it. But honestly, this book helped me understand the atonement in a whole new light. No matter how many mistakes I make along the way, as I use the atonement the final result WILL be counted as perfect. The atonement is not here to just erase black marks- it is here to help us progress and learn and ultimately become like Christ. And the most hopeful news is He is not just waiting for us at the top of the mountain, or waiting for when we reach a certain point- but rather He is with us every step of the way.I would highly recommend this book to anyone and everyone. But remember it is not a quick read. I read it over several months because I wanted to stop and ponder and write and read scriptures along with it. Have you ever listened to a talk or read a scripture that you felt was exactly what you needed to hear or that it was meant just for you? That's exactly how I felt about this entire book. Throughout my life I have struggled with making some of the same mistakes over and over again and then as a result have felt like I was unworthy of Heavenly Father's forgiveness. After reading this book I have realized that is exactly what the Atonement is for, not just for those one-time mistakes but for the ones we just can't stop repeating over and over again. I have a completely new perspective on the Atonement after reading this book. I 100% recommend it! This was an amazing book.The Atonement explained in an easy to read digestible way. Many of these things I never even before considered. It amazes me all that his Atonement covers and I think I have a better understanding and more peace now then I had before I read this. I would go so far as to say I wish every Christian especially LDS would read this book and understand a little better the part you are to play on this earth and what the sacrament and some of the other covenants we make mean in our lives. So well done. This was not what I was expecting! I very much enjoyed many of the analogies and the plain and simple conveyence of the subject matter. Having said that, Brad Wilcox comes close but does not surpass S. Michael Wilcox in his writing and I still haven't found ANY writing that matches the simplistic and logical outline of doctrine written so succinctly in the second book of Nephi. I will be returning to this again in the future and definitely recommending it to anyone wanting to further their understanding of Christ's Atoning gift and how to more fully utilize it. This book although deep, it was filled with lightbulb moments. Beautiful quotes and statements that really made me think. I borrowed it from my neighbor, although I kept it too long, it has reallychanged my life. He (Jesus Christ) was the only one great enough to become the least!Pres. James E. Faust "I am grateful that it is never too late to change, to make things right, to leave old activities and habits behind. "Christ doesn't just make up the difference, he makes ALL the difference. After hearing Brad Wilcox speak at TOFW, I really wanted to read his book on the atonement. His talk was insightful and the book was even more so because I took my time digesting what I read. He helped clarify the misconception that the atonement comes into effect "after all that we can do." The Savior is with us every step of the way, even the ones that take us backwards at times. As the subtitle reads, "Christ doesn't just make up the difference. He makes all the difference." I highly recommend this book and will be reading it again. Loved this book. Very readable. I think I liked Callister's "Infinite Atonement" even more, but there's a reason Wilcox is such a popular speaker. Lots of good analogies and things to think about. My favorite part was the idea that Satan (though he tried) didn't mess up the Fall, the Atonement, or the Restoration. The only way he can mess up Heavenly Father's plan now is to mess us up individually. And he does that many times by making us doubt in the reality and the love of God. If it were possible to give more than five stars, I would do it for this book. It is beautifully written and explains the Atonement of Jesus Christ in wonderful, beautiful ways. This book helped me to understand my relationship with my Savior in a deeper way. I view the Atonement differently and appreciate it so much more. This is a book that I will definitely re-read. There is so much to glean from its pages. I love this book! What a beautiful concept - I love every word.This is a book that will live by my bed to be read and reread as I come to understand the Atonement better and better. So many layers to discover. Also, discovering the part the Holy Ghost plays in all this has given me a new appreciation and love of the Holy Ghost. Truly he is a misunderstood part of the Atonement.The Gospel is amazing. This was a fast yet deep read. I started underlining and want to reread it so that I can use it for continuous reference. Truly an uplifting and inspiring book for daily reminders of God's plan and love for us. 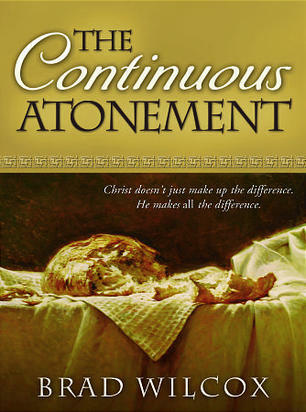 Wilcox uses real-life examples that illustrate so clearly Christ's Continuous Atonement in our lives. His writing is as if he is speaking--very easily understood.